This Black acrylic Jazz Bass Upgrade is for 3-pickup coil instruments. It gives you 35 pickup tones. Your stock bass is designed to give you a modest and inadequate 3 pickup tones. Don't you think it's worth a few dollars more to get a Grand Canyon Wide range of 35 Blues, Jazz, Metal, Surf, Country  plus the dozens of new and different pickup tones your stock bass simply cannot produce? The first group of switches (SW1, SW2 and SW3) are ON-OFF-ON switches used to turn an individual pickup coil Off and On. The middle position of each switch is Off. The down position turns the pickup On (in normal-phase) and the Up position turns the pickup on (in reverse-phase). First, putting two or three pickup coils in Series circuit creates a "Compound" (i.e., Humbucker) pickup that gives you about 8 to 15 percent More output (think Heavy Metal/Jazz tone). Second, because ALL the pickup coils are in a Series circuit, those coils MUST be On (either in normal-phase or reverse-phase). Any non-Series circuit pickup coil can be either Off or On (either in normal-phase or reverse-phase). Put switch SW4 in the Up position and coil-1 plus coil-2 are in a Series circuit. You MUST turn On both coils using switches SW1 and SW2 (either in normal-phase or reverse-phase) to hear any sound. In this example, pickup coil-3 (controlled by SW3) can be either Off or On (in normal-phase or reverse-phase). 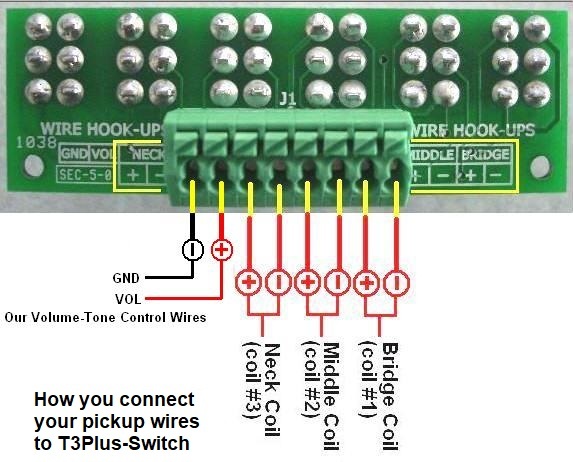 Put switch SW5 in the Up position and coil-1 plus coil-3 are in a Series circuit. You MUST turn On both coils using switches SW1 and SW3 (either in normal-phase or reverse-phase) to hear any sound. In this example, pickup coil-2 (controlled by SW2) can be either Off or On (in normal-phase or reverse-phase). Put switch SW6 in the Up position and coil-2 plus coil-3 are in a Series circuit. You MUST turn On both coils using switches SW2 and SW3 (either in normal-phase or reverse-phase) to hear any sound. In this example, pickup coil-1 (controlled by SW1) can be either Off or On (in normal-phase or reverse-phase). Put both switches SW4 and SW6 into the Up position and all three pickup coils are in a Series circuit. You MUST turn On ALL of the pickups using switches SW1, SW2 and SW3 (either in normal-phase or reverse-phase) to hear any sound. This gives you an incredible overdriven bass sound in spades.